As I take some time to focus on my new little bundle of joy, today I am sharing a guest post from Brittany of 17 Hour Days on a topic that all parents with more than one child must face at some point: sibling rivalry. Make sure to read her helpful tips and share your thoughts! Sibling rivalry—it’s a time-honored tradition among brothers and sisters. Even the sweetest, most well-behaved children get into scuffles with their siblings at some point. It’s completely normal. And not only is it completely normal, but sibling rivalry can even be GOOD for kids! That’s right, good! It can help them learn problem solving, listening and social skills. It helps them bond, keeps them entertained and helps them learn how the world works. In times like these you don’t care who did what—you just want some peace and quiet for once! While you probably will never completely eliminate sibling rivalry, there are several steps you can take to help your favorite little munchkins play nicely together. The more you can prepare the older sibling before the baby comes, the better. 1. Tell your child first and in private so they have some time to adjust. 3. Watch age-appropriate videos. We LOVE this video of a baby growing and developing in the womb. 4. Have the older child come to doctor’s visits and ultrasounds, if possible. 5. Let the older sibling help you tell friends and family the big news. 6. Practice being gentle with a baby doll. 7. Talk about all the fun things you will be able to do with the new baby. The time right after baby is born is a huge adjustment for everyone. These tips will help, but don’t expect perfection right away. 9. Arrange care for the first couple days, if possible. I was very lucky in that my second son was born at the beginning of a three day weekend. My older son had a blast at grandma’s for the weekend while my husband and I got settled in with the newborn. When my older son came home, we were better rested and ready for him. 10. Keep as much consistency in routines as possible. 11. Establish rules and consequences and always follow through. 12. Show the older sibling how to treat the baby gently. Children do not realize how big and strong they are compared to babies. 13. Teach the older sibling how to play with the baby. Children will love making baby laugh with games like peek-a-boo. This will help them bond. 14. Make the big sibling your special helper. My son loves running to get toys, diapers, wipes and anything else I need. 15. Neglect the housework. Spend time with your children instead. They are less likely to act up when they are well attended to. 16. Have one-on-one time with each child. Have daddy take one while you take the other, or stagger their schedules slightly. Small children are generally still pretty self-centered, but they are learning to think of others and make others happy too. Plus, they generally genuinely want to please. Use this to your advantage. 18. Praise each of them throughout the day, and encourage them to praise each other. 19. Let them solve their battles themselves. If you are constantly playing mediator, they will never learn how to do it themselves. Give them the tools, and then let them use them. 21. Do not compare your children. 22. Encourage the older one to help the younger one if they want to. They will be so proud–both of themselves and the baby. 23. Don’t take sides. If you weren’t there, you don’t really know who started it or who continued it. Punishing just one child breeds resentment. 24. Don’t play favorites. Even if you think you treat your kids equally, they will know if you prefer one over the other. 25. Get them working together. No one gets stories until all of their toys are picked up, for example. 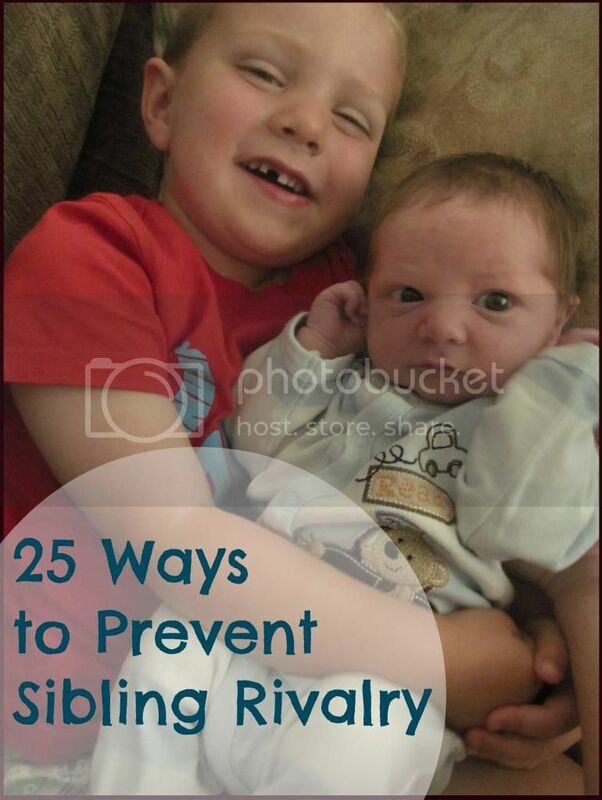 Do your children experience a lot of sibling rivalry? What ways have you found to deal with it? Brittany is a stay-at-home wife and mother of two very energetic little boys. When she isn’t busy picking up toys, changing diapers or trying to get the boys to play nicely together, she blogs about finding God in the midst of it all on her blog, 17 Hour Days.